We are raising funds to start the adoption process. Those of you who have been following our story are aware that we’ve been planning to adopt since before Addalyn died last year. 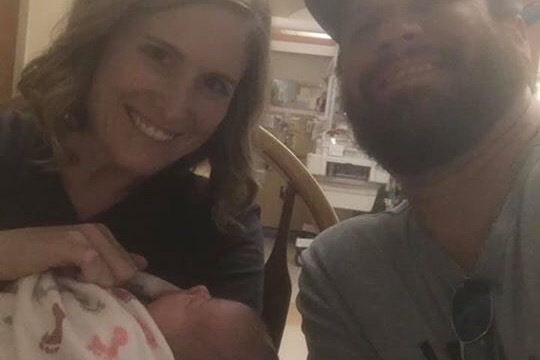 We’ve prayed about it and have decided a straight adoption will be easier on our hearts than fostering to adopt (Which was our original plan). While no one can ever replace Addy, we still have so much love to offer a child. We’ve had a baby room set up and waiting for over a year and have been praying for the child that will one day sleep in there. This isn’t something we can do alone. We need the help of our friends and family to raise the money it will cost to adopt and to pray for us along the way. The money raised will be used for all the fees associated with the adoption process (Home study, legal fees, birth mother expenses, etc). We are trying to raise $26,000 to cover the majority of the adoption expenses. 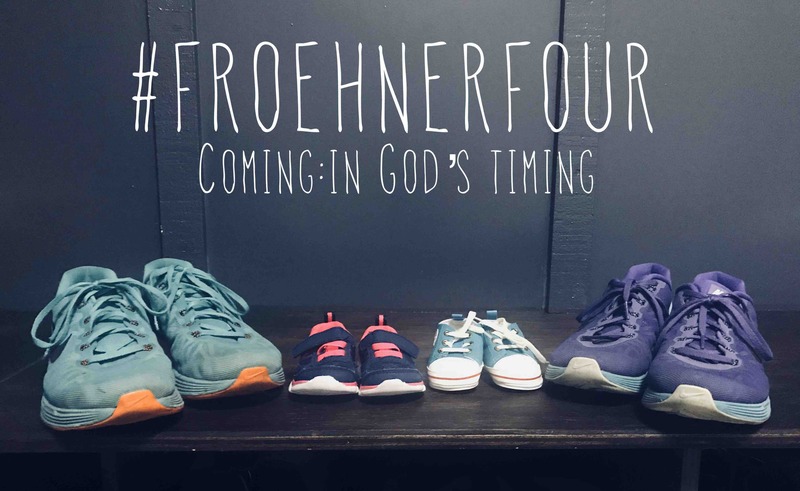 If you feel led, please help by contributing to us becoming the Froehner four! We also greatly appreciate prayers as we begin this new adventure in life. Dec 15th we got a call that a baby boy was born Dec 11th and his birth parents picked us to adopt him! We anticipated having more time to get the last of the funds needed together, but everything happened so quickly. We will put whatever we don’t have raised on a credit card (because nothing is stopping us from taking this boy home now), but would like to avoid that option if possible. We are also going to be making a Walmart run before we leave for some of the essentials (including a car seat! Haha), which isn’t included in he fundraising amount. We are still in disbelief with how quickly everything happened and are so in love with our little Everett Mason! We can’t wait to tell him all about his big sister in heaven! Thank you so much for all the help and prayers along the way. For those wondering...it has been 3 months since our home study was approved. God’s timing on this is so crazy and so evident that it was all Him! We just had to show up. We are super excited! After lots of waiting our home study has finally been approved and our photo book will now be shared with expectant moms at 7 agency locations across the US! Also, we just received an agency update (we get them monthly) and they currently have more expectant moms than families to match them with. It’s super exciting for us but also sad. In order for us to have a family someone else is going through a lot of heart ache. We are so thankful that our family will grow because someone chose life for their child. We will keep everyone updated, but we really don’t know how long we will wait to be matched. The avg wait time they give is 2 months-2years. With all that said we are currently about $1,000 short of being able to accept a match when it comes through. We know God will provide in the right timing, and if you would like to help us grow our family, we would greatly appreciate it!!! Thanks so much for everyone’s generosity and prayers so far! We have been preparing for our home study on Monday, with fairly short notice! We are excited and nervous about getting this part over with. Please pray for our nerves and for everything to go smoothly! It took about a month to get the puzzle I ordered, but after a few days and lots of brain power it is put together! Haha! 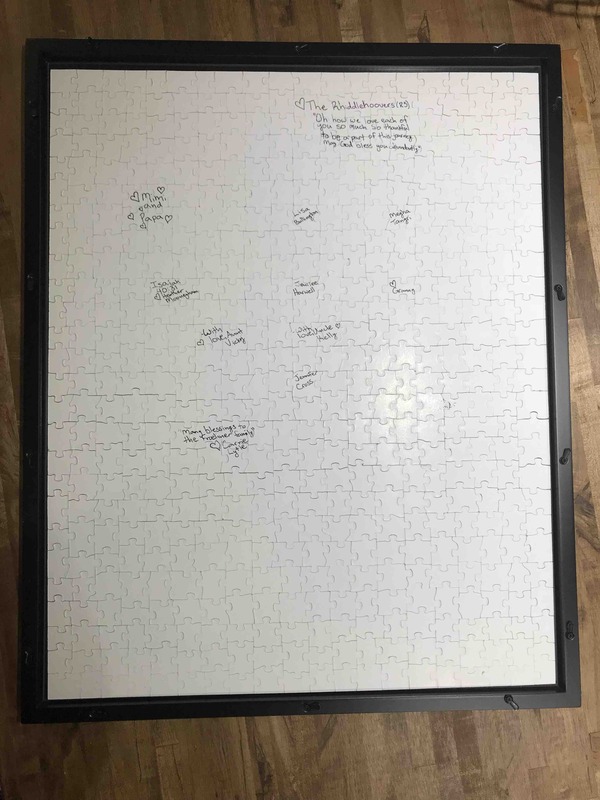 We are putting names on the back of the puzzle pieces and will be hanging it in the baby’s room with glass on both sides (so you can see the names). 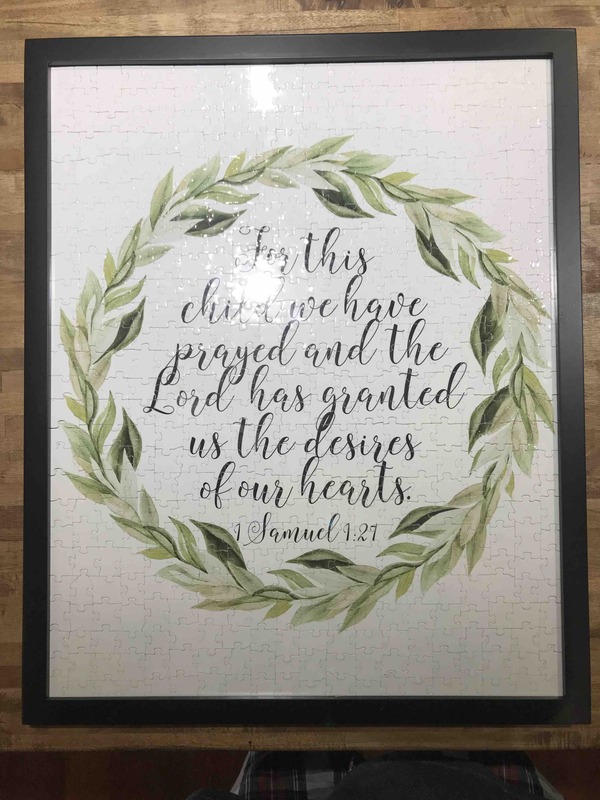 Make a $5 donation and let us know you would like your name added to the back of the puzzle, so when our baby gets older they can see who all was praying for them along the way. If you would like to add a note with your name just donate for additional puzzle pieces. Thanks so much for everyone’s support and prayers! Thanks so much for everyone’s support and prayers so far! We are still waiting on some final paperwork that needs to be submitted but are making progress. We are now down to less than $10k away from our goal! That’s amazing! We continue to pray for God’s provision and perfect timing in all this and the baby that will one day be a part of our family.